As the cool air of Autumn signals the end of summer, the high country of New Mexico begins its annual rite of passage by shedding the greens of July and August for the yellows and golds of September and October. During this time of year, there is no place on earth I’d rather be. 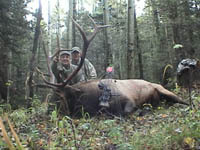 Thanks to Jack and Chris Brittingham, an invitation for a ‘couples’ elk hunt on their ranch near Chama, assures me, and my wife Sabra, that good friends and good times will provide a lifetime of memories in an environment that can only be described as “awe-inspiring”. For a week prior to the hunt, Sabra and I enjoyed clear blue skies and mild temperatures at our ‘home away from home’, in Pagosa Springs, Colorado, located about 50 miles north of Chama. The day we were all to meet at the ranch, things suddenly changed. A cold north wind brought moisture laden clouds to the area, dusting the mountain tops with snow and bringing rain to the lowlands. Although the rain delayed everyone’s arrival, it failed to dampen the spirits of our very special group of friends. As we settled into our spacious wall tents, the song of the elk reminded us that we were sharing an experience that can only happen at this time and in this place….and we were there! Sleep comes quickly and easily at 8,000 feet, and snuggled up in a warm bed with one’s spouse could make it difficult to rise in the morning…if not for the elk! No alarm was needed as my eyes opened at 5:30 a.m. to the sound of raindrops on the tent. Slipping quietly into my scent containment hunting gear, I joined Jack and the other hunters in the lodge where we quickly divided the ranch into 2,000 acre sections assuring each of us solitude in our pursuit of a mature bull elk. Aaron, my very capable guide and cameraman, and I headed south to an area we had hunted in previous years while the others scattered up the valley. It wasn’t long before we started hearing elk move. Although the bugling was minimal during the early dawn hours, the activity of the animals began to increase as the rain subsided. 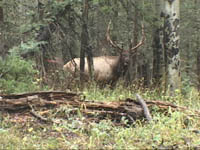 The first bull we were able to get close to was a immature 5 X 5. A small harem of three females wasn’t enough to keep the young bull from responding to our cow call, but we wanted a mature bull so decided to keep looking. Then we heard him. The resonate bugle of what had to be a big animal within 200 yards! Quickly, we moved up the mountain, not pausing to catch our breath for fear of losing contact. There are times to be cautious while approaching elk, and times to be aggressive. Aaron and I felt that this was an aggressive moment. We closed the distance, but could never get a good look at the bull. Suddenly, a cow spooked… busted! …or so we thought. Cow calling in a pleading way seemed to calm the other elk as no other timber crashing was heard. Finally, the bull bugled again, followed quickly by another bugle several hundred yards below us. We moved rapidly ahead, quietly positioning ourselves between the two potential competitors. Again I produced the mournful sound of a cow elk begging for male companionship. Aaron’s hand grabbed my shoulder before I could tuck my call away as he whispered, “Here he comes, and he’s a good one!”. My attention was directed towards movement 75 yards away. The heavy antlers gleamed in the sunlight that, just at that moment, brightened the day. All I could think was, “Fish-tails…what great fish-tails!”. This bull had all the elements one looks for; good main beam length, great G-4’s, and plenty of tine length on his 1’s and 2’s. The bull never hesitated as he searched for the forlorn cow. As he passed behind some trees at 40 yards, I drew my 65 # Bowtech BK2. At 23 yards he paused broadside, turned his head towards us, and started to bugle. His vocals were interrupted by the 100 gr. Rocket Naildriver broadhead crashing through his lungs. The bull charged forward 15 yards and realizing something was wrong, reversed course, crashed through a blow-down, and angled down and away from us. I must have held my breath, because now, I simply couldn’t catch it! Aaron congratulated me on what the video replay revealed to be an excellent hit, and we sat down in the splendor of the moment to enjoy our incredible luck and success. It wasn’t even 10:00 a.m. yet! After waiting for thirty minutes, we walked down to the arrow which was lying in a bush as though someone had carefully placed it there. We quickly picked up the bull’s track and followed 150 yards where the animal was found on his back, his 5’s buried in the ground. His last moments resulted in him toppling over backwards, his head supported by those magnificent antlers. the sun smiled on us again as we reflected on everything that had happened…and how fast it happened. One of my favorite sayings from Jack is that “A good hunt doesn’t have to be a long hunt”, and we proved that again on this day. 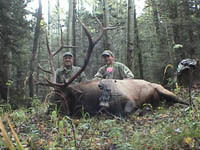 We quartered the bull where he lay, harvested the backstraps, and were back in camp to get the 4-wheelers by noon. By 2:00 p.m., all the meat was hanging, ready to become this year’s supply of steaks. That evening we all celebrated my incredible good fortune as the rough score on the 6 X 6 bull exceeded 298. I had set the bar pretty high…but anytime we all hunt together, you can bet someone will rise to the challenge! But that, my friends, is another story!